It’s been quite interesting to see what amounts to a ‘minor freak out’ going on in the blogosphere right now. 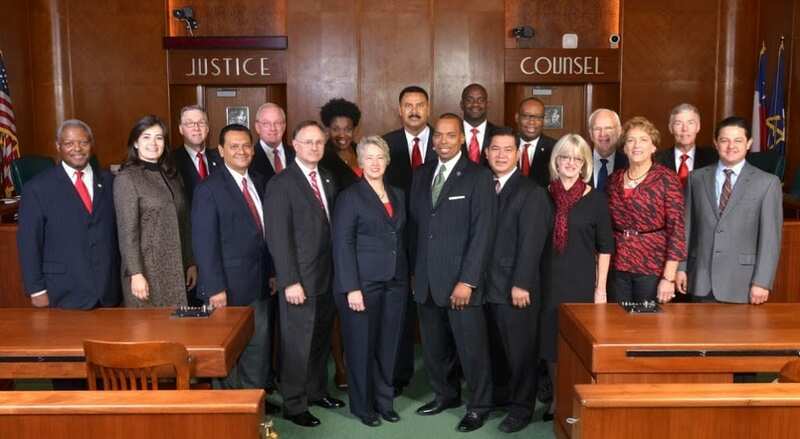 Suddenly, people are starting to realize that the Houston City Council isn’t as diverse as they expected it to be? And, particularly from a gender perspective, will be even less so in 2014. The Council, which currently has four women holding office, will be down to two in the new year. My response to this… where was the concern before?? The truth of the matter? 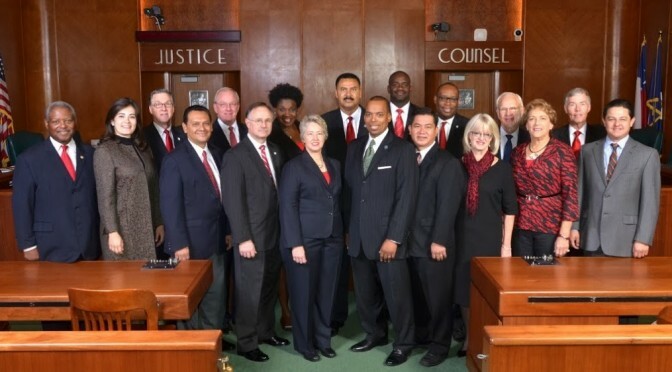 Houston City Council isn’t “diverse” right now… it’s still no where near parity to our actual city’s population. Four women on council is better than two, but still admittedly short of the 8 needed to be fully reflective of an even gender split. For a city that is over 40 percent Hispanic, Council is very much under-represented in that regard with just two Hispanic members. Not only will Council be losing 2 women in 2014, but it will also be flipping back to ‘majority white’ for the first time in nearly a decade. In a true reflection of the city’s racial makeup, the largest representative group should be Hispanic. Those are just snapshot observations, but to truly understand the make-up of council requires a broader understanding. Given his expertise on all things Houston politics, I asked Charles Kuffner of Off the Kuff for some history on the subject. Basically, Districts B, D, H, I, and K have been people of color barring anything strange. That’s five of eleven, or four of nine pre-redistricting. If District F is a non-Anglo, that will give you six of eleven (or five of nine), so you then need only two At Large members to be people of color to have parity. Since 2003, District F has been represented by MJ Khan, Al Hoang, and now Richard Nguyen. During that time, there have been at least two minority At Large members every term except one, in 2005, when Ronald Green was it. So that was the last election that Houston had a majority Anglo Council. And [technically] Addie Wiseman, who served in District E from 2001 through 2007, was half Hispanic, though she never really identified as Latina. In 2001, District F was represented by Mark Ellis, so three minority At Large members were needed, but there were only – Gordon Quan and Carroll Robinson. Annise Parker was also an At Large member, if that helps. However, Sylvia Garcia was Controller, and of course Lee Brown was Mayor, so I’d give 2001 a pass. In 1999 there were three minority At Large members – Quan, Robinson, and Orlando Sanchez, plus Parker, Garcia, and Brown. In 1997 there was Sanchez and Robinson At Large, but Martha Wong represented District C, so once again parity was achieved. Interestingly, 2005… the last time City Council was majority white, was also the only term that it was majority female… 8 women to 6 men served. So by both measurements of race and gender, 2014 will be an anomaly as the most majority male and majority white Council in the 21st century. That’s the data. But it’s important to frame all of this as an anomaly… simply a result of how the 2013 elections turned out. There were a fairly diverse group of candidates on the ballot, and certainly there is no reason to believe that the decision of voters had anything to do with race or gender. Nor does the lack of diversity serve as any indication that these Council Members will not serve the people of Houston fairly. But perhaps it should cause the city’s political community to take another look down the pipeline to make sure that people from all backgrounds remain interested and motivated in city government. That’s the only way to really ensure that the decision-makers in government truly reflect their constituents in as many ways as possible. Gallegos’ victory makes him the only openly gay Latino city council member in Texas. 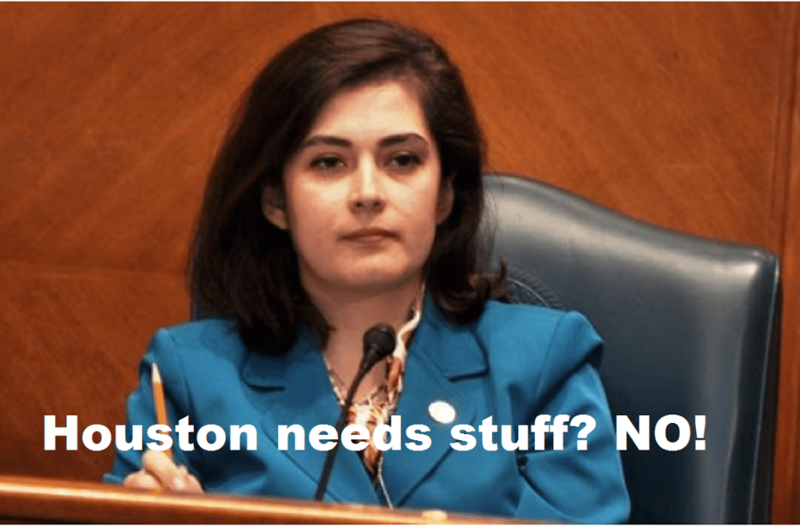 It also gives Houston two out council members, in addition to lesbian Mayor Annise Parker. Out Councilman Mike Laster was elected to a second term in November. Together Gallegos and Laster are two of only four openly gay city council members statewide — along with Joel Burns in Fort Worth and Scott Sherman in Pearland, according to the Victory Fund. 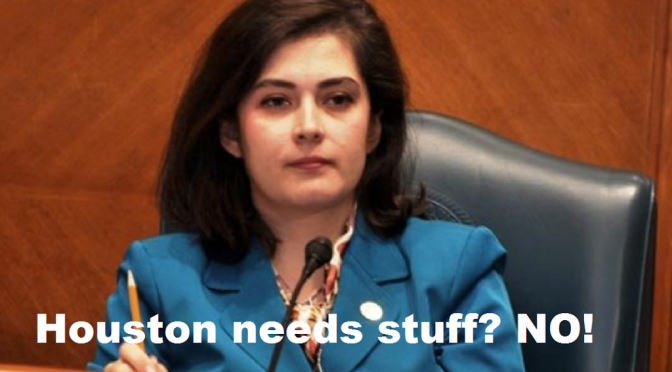 So even in a very odd election year, Houston City Council still finds ways to make progress. Over the weekend, the winds of change blew through the halls of Houston and HCC municipal governance. In Saturday’s runoff election, turnout was expected to be light and that certainly proved to be true. With a meekly 4 percent of overall voter turnout, some of the most contested races of the year were decided. Given that such a small number of voters lent their voice to the runoff, it’s hard to garner any real indications of how this reflects the city’s political trend map. But one thing is for sure… people who vote in runoff elections are the most determined voters you will find anywhere. There is no better evidence for this fact than in Houston’s District A. In 2011 Tea Party Challenger Helena Brown, armed with a bevy of anti-government, anti-establishment voters, defeated then- Incumbent Council Member Brenda Stardig by 605 votes. In the year and a half that followed, district residents got to know Council Member Brown as being true to her word. After racking up an extraordinary record rejecting even the most mundane city business, District A citizens (at least those precious few that voted in the December 14th runoff) decided that they have had enough, rejecting Brown’s extremism and reinstating Stardig to her former seat. Interesting what honesty in politics gets you these days. Though At Large 2 Council Member Andrew Burks is far from a ‘right-wing extremist’, he is known for some measures of extremism just the same. In his first term, he had several instances of berating constituent speakers that disagreed with him, and perceived hostility toward some of his elected colleagues. These very public shows of difficulty certainly didn’t do him any favors during the 2013 election, but finally on Saturday, they may have proven to be his downfall, as Burks was defeated by challenger David W. Robinson. Once again, extremism lost out. Perhaps the most fiery race of this years election season was in District I. Prior to the November elections, four candidates fought hard to encourage turnout in the low-performing district, and each candidate ended up with close to equal shares of the votes. So much so in fact that only 25 votes separated second-place finisher Robert Gallegos from 3rd place Ben Mendez. But a second-place finish turned out to be the right prescription, as Robert Gallegos defeated Graci Garces in the runoff election, and will now represent the citizens of District I. There were some less exciting race results as well. In District D, frontrunner Dwight Boykins went on to handily defeat Georgia Provost. Adriana Tamez, who was the top vote-getter in the General Election, went on to oust incumbent Herlinda Garcia for HCC District 3. Zeph Capo won the HCC seat for District 1 by defeating incumbent Yolanda Navarro- Flores, and Robert Glaser retained his top position and went to win against Phil Kunetka in HCC District 5. Even with the defeat of 2 incumbents, these races at least gave an indication of what may occur from the General Election totals. But to have a runoff election that results all 4 incumbents beaten? To say the least, it’s an anomaly. Or perhaps (particularly in the case of City Council), the anomaly was actually 2011, and 2013 was simply a course correction back to less of the extreme. Texpatriate, Off the Kuff and Brains and Eggs have much more. Only time will tell. But for now… so long Helena Brown. The race for Mayor of Houston is big business. Whether that be from the standpoint of running the government equivalent of a $5 Billion dollar corporation, or from the nearly $2 million dollars needed to wage a credible campaign, having a serious shot at winning the office takes some serious commitment. When I first met Ben Hall back in April, that serious commitment was on full display. He spoke with careful eloquence and clear conviction about why he was entering the Mayor’s race. He proved to be very knowledgeable about the Bayou City, and spoke of how he’s been disappointed in the work of “the incumbent” over the past 4 years. Hall offered little in the way of specifics, but his vision for the city was truly grand. I knew that Mayor Parker had drawn a real challenge for the 2013 elections. That was then, and this is now. 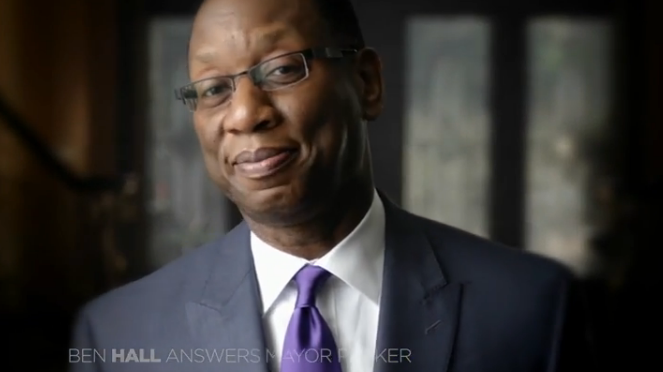 Ben Hall has not lived up to a very promising first impression. 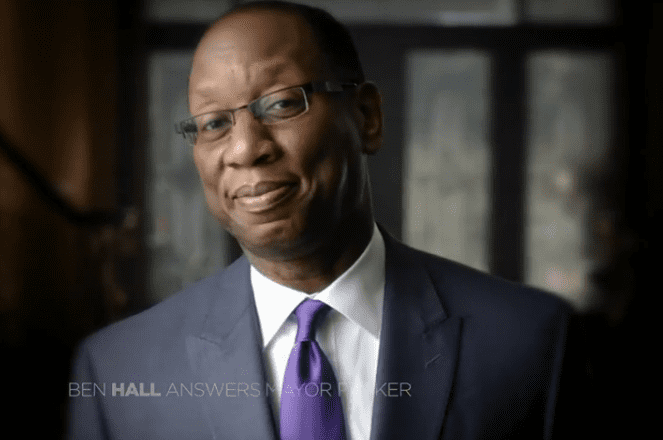 Instead of offering a different vision for the city, he instead chose to berate the incumbent as “small-minded”, when in reality it is Hall’s campaign that has proven to be so. While Hall has spent his time being small-minded, Mayor Annise Parker has mostly done the work of the city in an admirable fashion. After four years of weathering a difficult economic storm, Houston businesses are doing better than any place in the nation. This is partly due to the good fortunes of Texas’ strong energy sector, but make no mistake, the city would be in a worse position if not for Parker’s dedication and meticulous planning. Programs like Hire Houston First gave contracts to local businesses in a time that they were needed the most, helping to quicken the Bayou City’s lift out of the Recession. Parker led major trade missions Brazil and Turkey, planting the seeds for important economic opportunities in the city’s future. Though we may not see all of the progress yet, the Rebuild Houston initiative created a long-term, fiscally responsible plan to fix city streets, and decrease debt. None of these things are paying immediate dividends, and none of them can be held up as some shiny political prize. But the long-term investment in Houston is going to make for a better city, and Parker is doing it the hard way. She’s tackling big issues, one day at a time and seeing how we can make things better. For all of the things she’s tackled head-on, there are still a host of issues where Annise Parker has been far too risk averse. 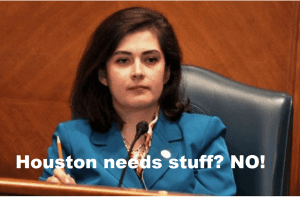 Texas Leftist is hopeful that her third term will finally bring some significant legislation to protect GLBT citizens from discrimination, and to address the troubling discriminatory practices within Houston’s law enforcement agencies. But for 2013, Annise Parker has proven that she deserves to win reelection. I look forward to what the 3rd term brings. The pick for Mayor of Houston is Annise Parker. As the second-largest College system in Texas, and the 6th largest in the United States, Houston Community College is a pillar entity in Houston and Southeast Texas. Even for Texans that don’t directly attend HCC, they interact with students and alumni on a constant basis. It is an integral part of the educational life of Houston… almost as much as its progenitor the Houston Independent School District. HCC’s trustees are elected by voters in Houston and other cities within the school’s jurisdiction. For all of these reasons, Texas Leftist wanted to examine these races and issue endorsements for the candidates. In HCC’s District 1, current incumbent Trustee Yolanda Navarro Flores is running for reelection. But given a torrid history with the HCC Board, including suing her fellow trustees for defamation, it’s no surprise that she has drawn two challengers in the race. It’s a sampling of many issues that have plagued the Board of Trustees in recent years. Both of her challengers, Kevin J. Hoffman and Zeph Capo, have strong records of public service. But in this race, Mr. Capo’s record in the classroom, especially in dealing with at-risk youth is what makes him stand out. His first-hand experience working with students not unlike many attending HCC would prove a great attribute to the system. The 2013 pick for District 1 is Zeph Capo. District 3 has incumbent Herlinda Garcia with two respective challengers. Dr. Adriana Tamez is an educator with extensive knowledge of HISD and the K-12 system. But Dane D. Cook also has a wealth of unique experiences, both as a recent student of HCC, and as one of our nation’s veterans that would be of great asset to the school’s governing body. Many of the school’s current Trustees are so far removed from the student experience that their vision for the future of the institution can become uninformed by reality. It’s true he is the youngest candidate, but Mr. Cook’s leadership skills have been proven both in the theater of war, and transition back to American society. This is an experience that will continue to be vital to HCC as the war in Afghanistan draws down and our soldiers come home to face real-world decisions about the next stages of their lives. For many of Houston’s veterans, HCC will be a critical part of that journey. The 2013 pick for District 3 is Dane D. Cook. District 5 has been mired in difficulty as well, following the resignation of Richard Schechter and later his interim replacement Leila Feldman, so it is certainly the hope that voters can find some stability for this constituency. As a native Houston and lifelong resident of the District, candidate Robert Glaser will be there to provide stable leadership. Bringing his experience in both public education and as a small business owner, he has been able to see the important role HCC plays in training the Houston workforce. As college costs continue to skyrocket, he also sees the benefit of reducing redundancy in college and high school programs to both enrich the student experience and lower education costs for families. Affordability is perhaps the greatest attribute that HCC has, and Mr. Glaser brings that aspect as a central part of his goals for the system. The 2013 pick for District 5 is Robert Glaser. Though District 7 incumbent Trustee Neeta Sane has drawn one challenger in this race, she has proven her skills as an effective leader and visionary for the system. Like her rapidly growing and diverse district, Ms. Sane brings a wealth of diverse experience as a naturalized US citizen and small business owner. She has demonstrated how HCC can be more than an educational institution, but can really mold and shape a growing community. Ms. Sane has overseen over $140 million dollars of investment in her district, including the establishment of the Alief ISD Early College High School, the HCC Stafford Fine Arts Center, the ASPIRE scholarship program to promote educational opportunities in the Asian community, the Bissonnet workforce building and HCC Missouri City. She has a thorough understand of the growing needs in her district. For all of these reasons, the 2013 pick for District 7 is incumbent Neeta Sane.